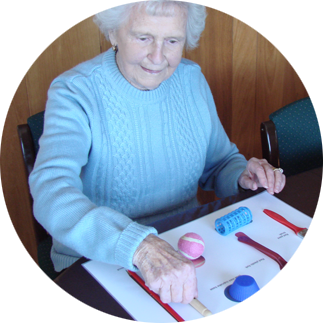 The Montessori Ageing Support Services Quality Assurance Programme (MASSQAP) has been developed to partner with and support all aged care services providing Montessori environments and to engage these services in a process of review, improvement and maintenance to ensure the highest level of Montessori experiences for people receiving care services that they believe to be Montessori in nature. The emphasis for the MASSQAP is on continuous improvement rather than accreditation. It highlights Montessori indicators for quality practice and supports these with a model of mentoring and professional development. All care communities are eligible to participate irrespective of the Montessori training background of staff. The MASS website lists all services participating in the MASSQAP. The MASSQAP not only includes an emphasis on continuous improvement but also a registration component. Care communities that have been assessed to meet the majority of MASSQAP quality standards will be designated as Montessori Registered™ care communities. APPLIED – Have applied to the programme and committed to the Montessori Charter. PARTICIPATING – Have committed to the Montessori Charter, submitted an Annual Quality Improvement Plan and are participating in mentoring. REGISTERED – Montessori Registered™ have had an assessment visit and been assessed to be meeting the majority of Quality Standards. That all elders have the right to an environment that is carefully prepared so that it meets and nurtures the needs of each person. That each person has the potential to be an active participant in their community (facility, centre, unit). Montessori environments are aligned with individual needs, interests and strengths for optimal social, emotional and cognitive support and activities. Opportunity for choice, independence and self-initiated activity are elements of the prepared environment. Memory supports are used routinely to support cognitive deficits and maintain orientation to time, place and person. The involvement of elders in roles, routines and activities enriches the living environment, sense of belonging, self-esteem and feelings of worth. Download the MASSQAP Brochure for details and pricing.